As you may already know, next year we’ll be opening a second brewery, on the Northern end of the Gold Coast. We found the perfect location in the original Riviera sheds on Pine Ridge Road in Arundel. You can read all about how we got there on the blog. 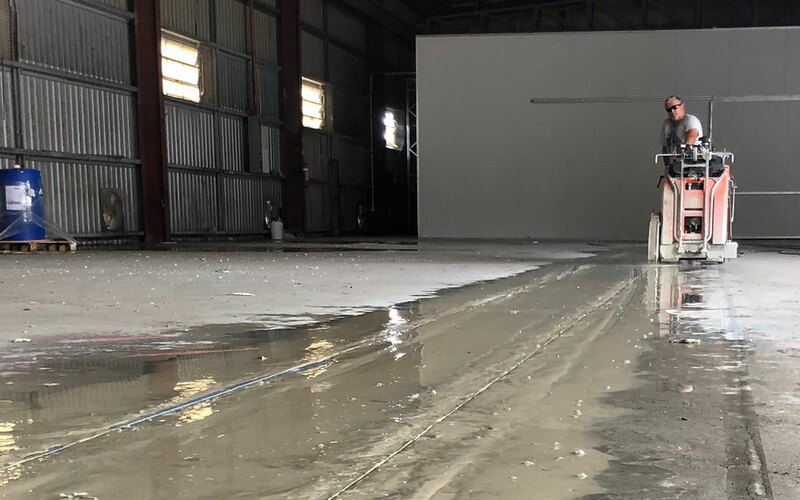 The space is a 1,300sqm warehouse with 8m ceilings and a 200sqm mezzanine for offices.That will enable us to build a 150sqm taproom and a 6,000 L brewery (both 3 times the size of our current ones), with 17,500 Litre fermenters (4 times the size of our current biggest ones) and a significant level of automation which will allow us to better control our consistency. We’re stoked to report that our brewery expansion plans are in full swing and that things are running pretty much to schedule so far. We’d like to think it’s all been because of our exemplary planning and time management, but experience tells us that we’ll most likely be thrown a few curveballs along the way, regardless of how well organised we are. In fact we already have (you can read more about this further down.) But for now it’s been relatively smooth sailing. In this post we’ll bring you up to speed with where things are at with setting up the new brewery, and what needs to be done next. As we learnt when we opened the Burleigh brewery, there’s a bunch of legislative requirements and council approvals that need to be covered off before you can throw open the doors and start brewing. Here are some of the major ones. A plumbing and trade waste plan needed to be drafted by our engineer and approved by Council and that has been fully signed off. The process we followed was to mirror the same plumbing and waste processes we have in place at HQ and then upscale and bump up the specifications to reflect the bigger size of the new brewery. Once we submitted the plans it only took about a month for approval which was a pleasant surprise. This was a big win, as these types of approvals can often drag out and cause delays to a bunch of other tasks. We experienced this when we were setting up the Burleigh brewery, so this time we made it an early priority. Plumbing and tradewaste has to happen before anything else, since you can’t cut drains until it’s approved and you can’t do much above the floor surface if it needs to be cut up. Our town planning application has been approved, as has our excise/liquor license. Once the space is ready we will also have to submit our application for a food license. You may be surprised to learn that when brewing beer, you are legally classified as a ‘food vendor’ – seems there’s truth in the rumour that beer is in fact one of the essential food groups! As we’ve talked about previously on the blog, water is one of the key components of brewing great beer. Water provenance (the specific water chemistry associated with particular regions of the world) is one of the main reasons why certain locations became famous for specific beer styles. Because beer actually consists of 95% water, Govs made it a priority to get the water supply coming into the new brewery tested and analysed, to establish that its chemical components and balance were conducive to our brewing processes. We recently put down a deposit on a bunch of new brewing equipment, including the 6,000L brew house, 6 17,500 fermenters as well as 2 bright tanks. Our equipment order covers everything you’d need to operate a brewery including the boiler, piping, control units etc as well as a 700L pilot system brew house and fermenters. This time around we’ve gone with Alpha Brewing Operations as our major supplier. For a brewery on this scale we felt going with Alpha from the U.S.A. was the right move. They make some great equipment and are looking to expand into Australia. We will do another post shortly on the exact list of equipment we’ve gone with for Black Hops II. The new brewery is going to be our production brewery, which will expand our volume from a potential 500,000 litres per year to multiple millions per year. While we won’t hit that target immediately, we wanted to factor in some heavy duty upscaling opportunities to meet our longer term goals. Govs will be heading overseas to check up on how our equipment order is progressing. The equipment build is well underway and we are expecting the equipment to arrive in late November or early December. We’ve already ordered a 2 vessel steam 700L pilot system with 3 x 700L fermenters and 1 x 700L bright tank, that will allow us to can and keg small batches at our new site. This is also being supplied by Alpha and it will also include a semi-automated control system. The fermenters will be on display at our taproom and will be stackable when we order more. Alpha have also supplied us with a bigger and faster 8-head inline canning machine which should enable us to empty a tank in one long day of canning, which would be around 2,000 cartons. The machine is built and is currently being tested with our cans over in Lincoln, Nebraska. We’ve also ordered a Case Packer Sealer from Fibre King in Brisbane. This nifty piece of equipment will let us automatically package our cans directly off the canning line and straight into our cartons/boxes, rather than our current manual packaging work process. Fibre King make automated equipment for larger scale operations but are coming to the party to make a new piece of equipment to suit our size operation. We are the test dummy for the item and once it’s all done, they will make it commercially available to other breweries. The machine will be able to pack 4 packs and glue the boxes without any outside human support. This piece of equipment is scheduled for delivery in January which should work out OK timing wise for our operation. We’ve purchased a new forklift, which we’re already putting to good use at the site. 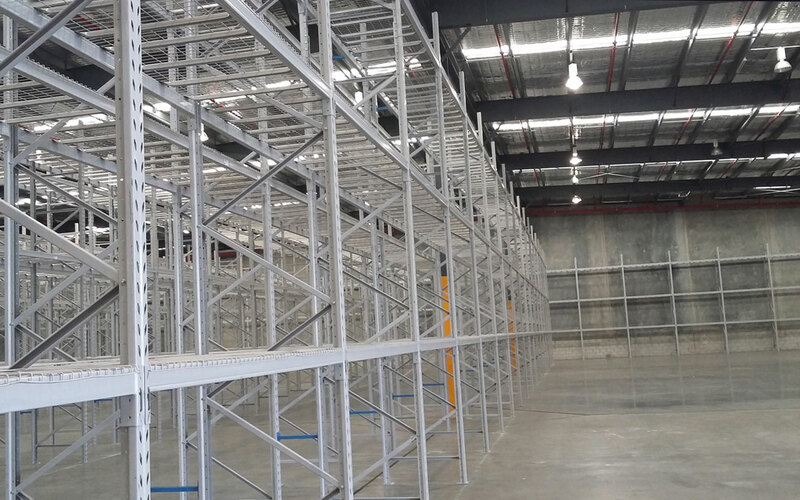 And we also bought a scissor lift, on account of the 8 metre high ceilings. And Eddie went out and got his scissor lift licence. The factory space we’re moving into used to be a workshop. So there’s been plenty of filling in and grinding back work going on so far. 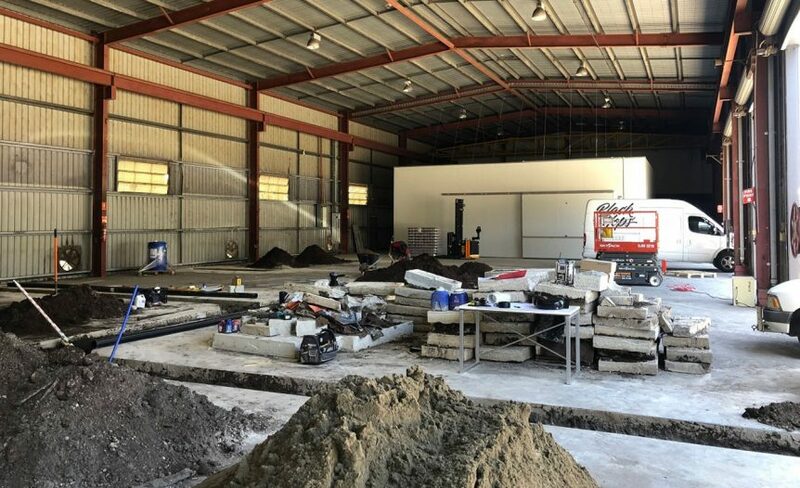 Now that our plumbing and trade waste approvals are locked in, we’ve also been busy digging up floor space, ready for the plumbing and drainage to be laid. 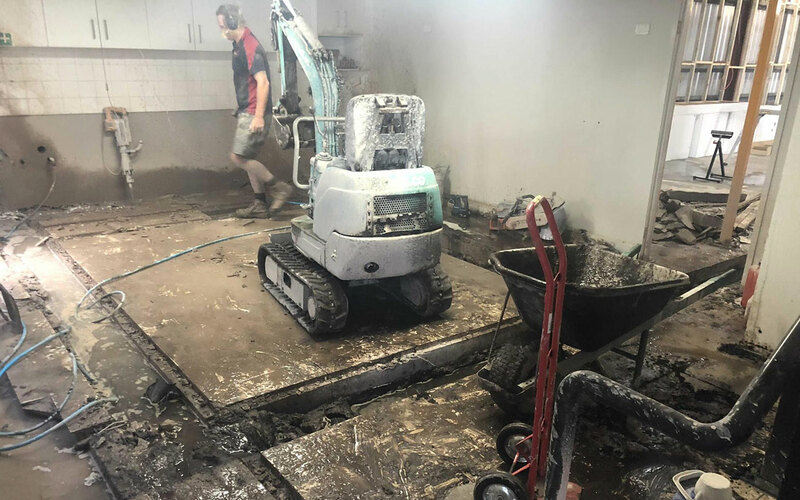 The process is to cut the concrete for the drains, put all of the plumbing in place, then get council approval before filling the drains in again and working on the floor. This process happens gradually, we are about half way through at present. 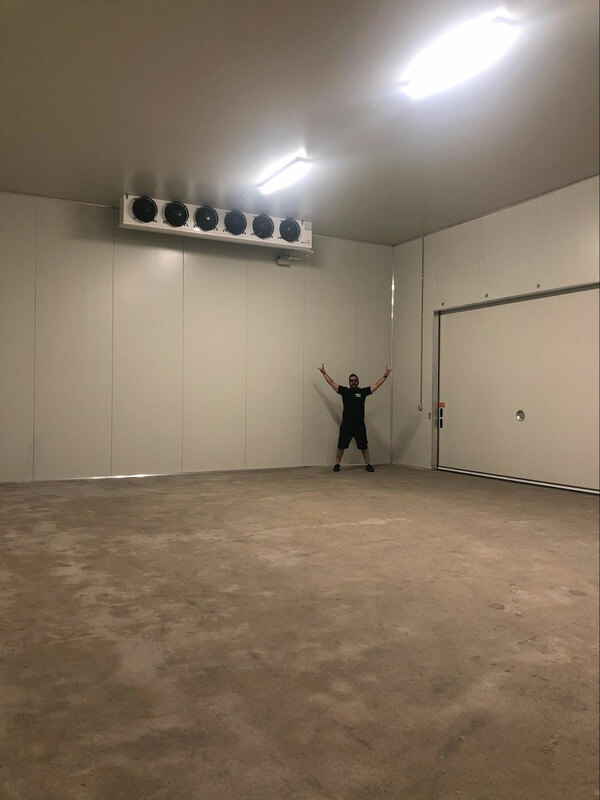 Our new Cold Room is setup and in use. It’s much bigger than our current one at HQ, at 100sqm in floorspace and 4.6m height. Our current cold room is 48sqm and 3m height and is currently maxed out on account of how much beer we’re brewing. So the new cold room has already been put to good use, acting as a temporary overflow cold room for us. 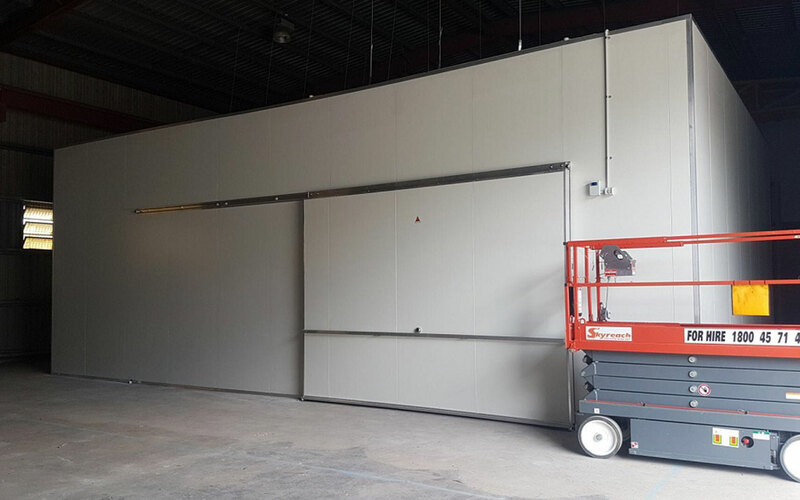 We worked with All So Cool on the cold room build and it was built very quickly and efficiently. We found some pallet racking from an old Masters store that had closed and we used that to set up our Dry storage area. This was all done in one day. The new taproom will be one of the defining features of the new brewery. We drew up a design doc to workshop with our builder and got to work soon after getting the keys. We have packed out most of the walls and have started working on building the tables. The drains for the bar plumbing has been cut and once filled in, we can get to work building the bar and coldroom. We are also building a toilet block with 5 toilets and a shared basin which is currently being built. The image below shows our plumber Kruges Plumbing cutting the drains for the bathroom block. This image shows where we are at now, getting closer. 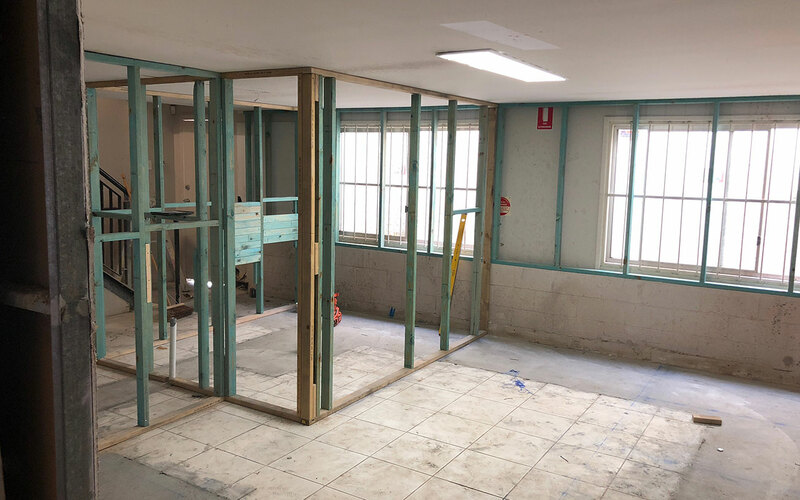 We’ve been working with our regular tradie Dan from DCQ Constructions on the fitout. We’ve made a great start towards our goal of opening our new brewery towards the start of 2019. If you want to follow the build closer follow us on social media, Facebook, Instagram, Twitter, Facebook Ambassador Group.